Ronald and Debi Mackenzie of Cruise Loch Ness with the new catamaran. 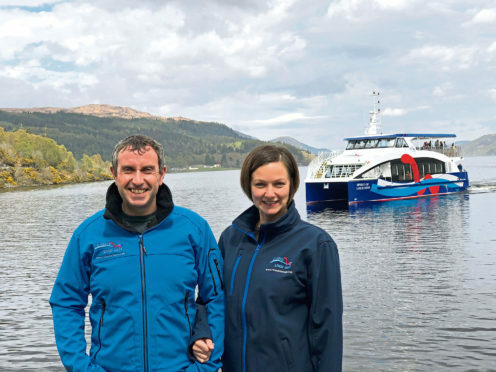 A Highland cruise company has added a £1.5 million catamaran to its fleet as it gears up for the latest tourist season on the world’s most famous loch. Cruise Loch Ness is anticipating a 20% increase in summer passenger numbers following the arrival of the new vessel, The Spirit of Loch Ness. The family-run business, which is based in Fort Augustus, carried about 150,000 tourists last year. It operates another cruise boat as well as three high-speed, inflatable craft. With sonar equipment and 15 monitors across the two decks, passengers on the latest addition to the fleet can monitor the murky depths for sightings of the legendary monster. Cruise Loch Ness managing director Ronald Mackenzie said: “The Spirit of Loch Ness has settled well into the loch and is a superb addition to our fleet. “It gives us the capacity to carry a further 100 passengers, bringing us up to nearly 354 across the two boats. With decades of experience and knowledge of the industry, we custom-designed this catamaran to allow us to bring the best possible customer experience to passengers who come here especially to hunt for Nessie. The Spirit of Loch Ness was commissioned following a 20% increase in passenger numbers during 2015, with the company later securing 50% funding from Clydesdale Bank towards the new-build. It has replaced an older, smaller boat which was sold to a cruise operator on Loch Lomond. Clydesdale Bank relationship manager Shelley O’Neill said: “We have worked with Cruise Loch Ness for a number of years. Cruise Loch Ness is planning to commission another new-build vessel in the near future, aiming to bring it into service on the loch some time during 2020.